BBC News – Molten metal batteries aimed at the grid. Engineers in the US have invented a battery, made of three molten metals, which could help smooth the power supply from renewable energy sources. Previous battery designs have largely been too expensive to help store energy on the scale of a national power grid. The new liquid battery has a negative electrode made of lead, which is cheap and melts easily, mixed with a dash of antimony to boost performance. This lowers its cost, as well as the heat required to liquefy the metals. Published in the journal Nature, this latest attempt at a scalable solution for storing electricity is set for commercial demonstrations within a year and has been greeted with enthusiasm by engineers in the UK. “Sometimes, when the wind is blowing strongly, we have spare capacity available – if only we could store it, so that we could use it when the wind isn’t blowing,” explained Prof Ian Fells, a fellow of the Royal Academy of Engineering and former chair of the New and Renewable Energy Centre. “Using these molten metal electrodes is, it seems to me, a very good idea,” he told BBC News. 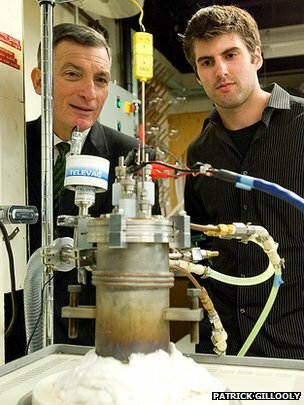 The overall concept for the battery is relatively simple: inside a can there are three layers of very hot liquid, which separate of their own accord – “like oil and vinegar”, according to the project’s senior researcher Prof Donald Sadoway, of the Massachusetts Institute of Technology (MIT). On the bottom is the very dense mixture of lead and antimony; next comes a “molten salt electrolyte” – effectively table salt, which is liquid at these temperatures; and finally a layer of lithium floats on top. When the cell is discharged, all the lithium is actually transferred to the bottom layer. But when electricity is directed into the cell, the lithium is pulled out of the alloy layer and returns to the top. “It’s this back and forth, of the top layer disappearing into the bottom layer to generate electricity, and then reconstituting the top layer by consuming electricity, that gives you the rechargeability of the battery,” Prof Sadoway told the BBC. The whole set-up has to be kept at some 450C, which is no small feat, but a vast improvement on the 700C required by an earlier design, whose electrodes were magnesium and pure antimony. When Prof Sadoway’s team tested out the cheaper lead-antimony mixture, they expected to be faced with a trade-off. In fact, they saw almost no decrease in voltage, even with 82% lead in the mix. They knew they were onto a winner. “That was the surprise,” Prof Sadoway said. His team later figured out that the reason behind their pleasant surprise was that the lithium, when it travels to the bottom layer as the battery gets used, seeks out antimony atoms to bond with. So the dilution with lead doesn’t interfere with the electricity storage – it just makes the whole set-up much cooler and cheaper. Prof Sadoway said that key finding was “really, really exciting” because the commercial implications were obvious. Price is the main sticking point, for all the various battery systems that have been proposed (see box). Dr Frank Marken, a physical chemist at the University of Bath, was also impressed by the design. “It’s not revolutionary in the idea – but it may be revolutionary in terms of the application,” he said. The durability of the system was particularly of note, Dr Marken suggested. In fact, the team at MIT put their prototype through 450 full charge cycles – meaning the lithium layer entirely disappeared and then was reinstated, every time – and the battery lost just 15% of its capacity. Several years ago, Prof Sadoway founded a company called Ambri to commercialise his team’s research. That company now hopes to be deploying demonstration units “within a year”, he said. The first test sites will be at Cape Cod in Massachussetts and in Hawaii, which is a particularly promising market.